This free version works on a 50/50 referral commission split. If you pay for Society6 Nifty membership, all new links you create will use your curator id and you’ll get 100% of any arising referral (curator) commission. It’s not just for curators, if you’re an ordinary S6er, you can use it to speed-pin/share from your collections down your own social media. There’s one thing that really excites us about promoting Society6 product designs. It’s that the success rate is better than with Zazzle for any given effort. Read on to find out why. As you can imagine, we get lots of requests to look at stores. Unfortunately we don’t have the time to assess and give feedback on them. As promoters, all our time is taken up in promoting great designs to our social media channels – mainly Pinterest. We and others have collections with up to 240 items and that’s what we’re looking for from you. The collections whose products we tend to promote have a single unifying theme, on lots of different products and a variety of on-theme art. What are promoters looking for from you? So if you have a collection with a large number of products (up to 240) that meets the above, please let us know by joining the NiftyToolZ, Tips and Support Facebook group and telling us there. We love hearing from you! …and that way you get promoted even more for free! However, that doesn’t stop YOU using our free tool to promote the contents of your collections to your own Pinterest, Twitter or Facebook. 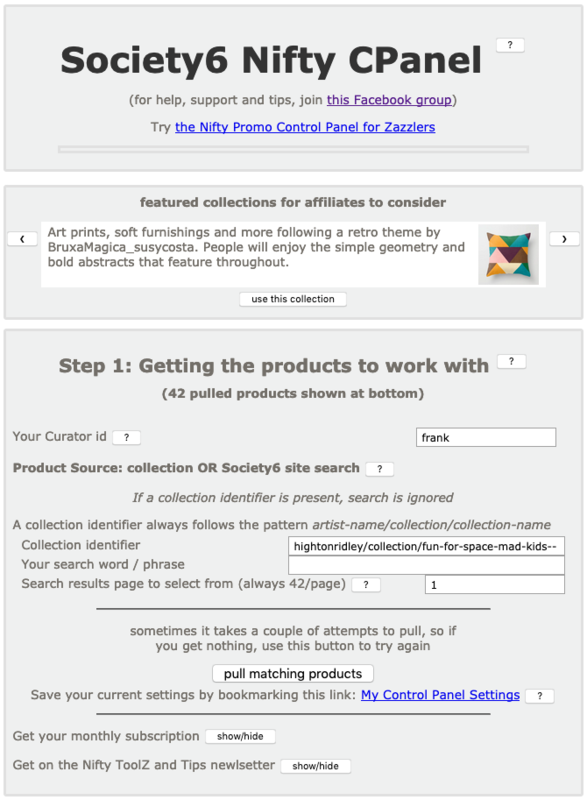 We love helping people to help themselves, so give the tool a try with your own collection and the individual product sharers in Step 2. Why a better success rate? If you’ve been promoting Zazzle designs for a while, you’ll know there are many ways to lose a referral with them. There are lots fewer with Society6! On the downside, Society6’s cookie expires after 30 days as opposed to Zazzle’s 45 days. And, even though Society6 gives only 10% referral (curator) commission, in the long run, there’ll be a much better return on effort. See a screenshot-based tutorial for the nIFTTTy Scheduler tool. It shows you how to create an applet in IFTTT that uses a nIFTTTy Schedule to pin on your chosen Pinterest board.